Update 2018: Beauty Box 5 is no longer in business but don’t worry, you can check out our other beauty reviews! Presents? Who doesn’t love presents?! Beauty Box 5 has created a new and ingenious way of making sure you get a present every month! With this wonderfully creative idea, there is now a way in which you can receive a box of presents every single month! And not the type of present that you hope would come with a receipt. We are talking Beauty Box 5 presents! Just one package I tried out had exfoliating gloves, lotion, chapsticks, body wash, and a bonus mirror is just 1 month’s box of presents. What Beauty Box 5 has done is take the work out of finding great products. Their team scourers the market for the top beauty products. When you think of the time and frustration you go through trying a variety of different lip balms it can become mind-numbing. You’ll buy some products, which may be worthless, and others that may be mediocre and while you settle on something, there still may be a much better product out there. The Beauty Box 5 team looks at dozens of products and only settles on sending you a bevy of the best products and all for a fraction of the price you’d pay if you were buying them separately. The greatest value here with Beauty Box 5 is that you will get a sampling of the best saving your time and money and when you decide on what products you want to continue to use, Beauty Box 5 has them available for you at their site. Nubar Cuticle and Nail Oil (Retail $10) This jojoba elixir is available in cute candy colors that can soothe inflamed skin when you rub a small amount around the nail. That Awkward Moment Compact Mirror: This was a bonus product for the new movie That Awkward Moment. Epic Blend Hemp Coconut Lip Balm (Retail $3.39) This non-GMO, gluten and petroleum free organic lip balm is not tested on animals! Jergens Daily Moisturizer (Retail $6.99 for 21 fl oz) This everyday lotion will keep your skin smooth and hydrated. H2O Plus Sea Spa Lotus Body Wash (Retail $17.00 for 12.5 oz) This body wash is made with mineral rich red alga, aloe extract, and vitamin E and smells like sea grass and aquatic florals! I also received a pair of Swissco Bath & Shower Exfoliating Gloves (Retail $5.00) Slip these on and rub away dead skin to leave your body smooth. With birthdays only coming once a year to us this way of receiving or giving new things is clever and ingenious! Upon receiving my box I was excited to open it. The goodies that are packed inside the clever and adorably wrapped package, did not let down. The Epic Lend A Hand Coconut Chapstick was smooth and delicious. The bath and shower exfoliating gloves made my skin feel like a baby’s bottom. The Lotus body wash from H2O Plus was refreshing and made me nostalgic for the beach. It was just plain fun to not only get this nice surprise but to be able to experiment with each new product knowing that it was such a great deal. I was saving time and money. Not only would I sign up to receive these monthly but I would highly recommend them to all of my friends and even would go to the extent of gifting them as a present! In order that my friends’ birthdays never stop, and they will get a new box of 5 new presents each month! I highly recommend and encourage you to look into signing up for Beauty Box 5! You will love it! 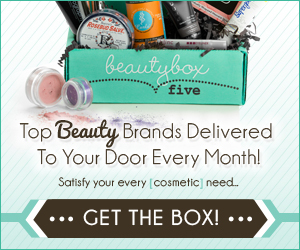 Sign Up For Your Beauty Box 5 Subscription! The subscription runs only $12 a month, $30 for 3 months and $99 for a year plus you receive free shipping on all orders. Each month receive 5 hand-picked beauty products delivered right to you! Seems that subscription boxes are becoming more popular these days. I love the format of the ones, like this one, that give you the opportunity to try a lot of different brands of complimentary products. It’s nice to discover new brands that I’ve never heard of before. I love these boxes. It is always fun to get new items that you have never tried and have new faves. Cool! I love the hemp lip balm. It’s scary what is in a lot of lipsticks. Think about how they quickly get ingested! I’ll be on the lookout for a container of that.